I recently needed to make sure that two DIV tags always stay the same height even though both have variable content, driven from a database. I thought I would share the solution I used although would welcome any alternative ways of doing the same thing. So it’s a rather basic file and the idea is that no matter how much text you type into either column, the heights will always remain the same. Finds the height of the two columns and stores those values in two variables. I have had to check for IE as IE and Firefox/Safari interpret offsetHeight and clientHeight differently. Decides which is taller – the left or the right. Makes the shorter column the same height as the taller column. An example of the solution can be found here. If you have padding as part of the divs then you need to do some jiggerypokery to get the heights to balance again by subtracting the top and bottom padding from the Firefox/Safari side. If the top and bottom padding were 10px you would need to subtract 20. If anyone has any better solutions than this then I would be very open to it. Anyway, hope this helps. As always, any feedback (positive or negative) is always appreciated. 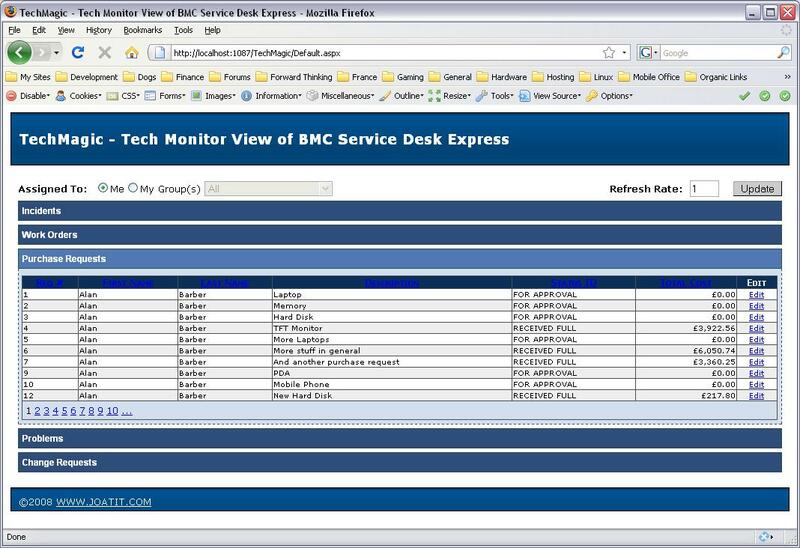 Network Associates/BMC have never supported the concept of users having a default group when they log into Magic/Service Desk Express. Judging by the comments in the forums lately I would suggest that this could be a feature for a future release. There were some rather elegant solutions posted in the forums that I think would do rather well, but in the meantime I set about finding a “workaround” to the issue. What I propose to discuss here is an alternative solution that you can implement yourself that will “remember” the user’s last logged on group between browser sessions by storing a cookie on the user’s machine. PLEASE TAKE A BACKUP COPY OF THE TWO FILES BEFORE MODIFYING THEM AS THIS IS AN UNSUPPORTED HACK! Also please be careful that when cutting and pasting from this blog to notepad that “” are not accidentally replaced with a different type of quotes. Save the file and that’s it. You may need to clear your browser’s cache and it is probably worth an IISRESET as well. As always, hope this helps, and any feedback (positive or negative) is always appreciated. 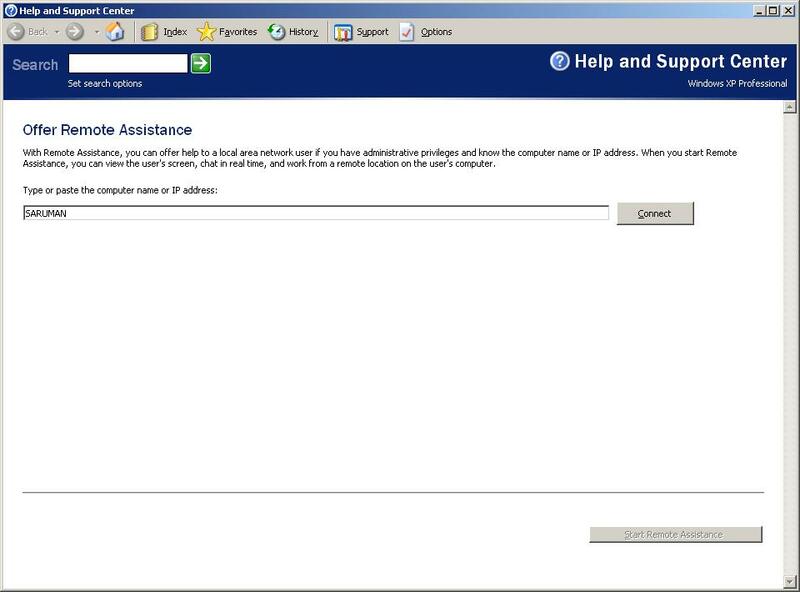 Open C:Program FilesBMCService Desk ExpressApplication Serveroptions_nailogo.asp in Notepad. C:WINDOWSPCHEALTHHELPCTRBinariesHelpCtr.exe -url hcp://CN=Microsoft%20Corporation,L=Redmond,S=Washington,C=US/ Remote%20Assistance/Escalation/Unsolicited/ UnsolicitedRCui.htm?machinename"
and click Build Launch File. If you find the Machine Name field in the ALIAS column and look across to the INTERNAL_COL_ID for that field, you will find 64.
and then using Form Customisation you can add a Customised Toolbar Button of type link on the Incident form to that newly exposed field. Now you can launch the Remote Assistance tool from the incident form, populating the machine name direct from the selected asset! Hope it helps – as always all comments very welcome!